Well, it's an American fairy tale, and the iconic outfit is red white and blue sooo...perfect day to release these! Gingham pinafores for your all-American Kansas farmgirls, ages CF, TF, and AF. The blue comes with both ruby slippers and silver, for you book fans. 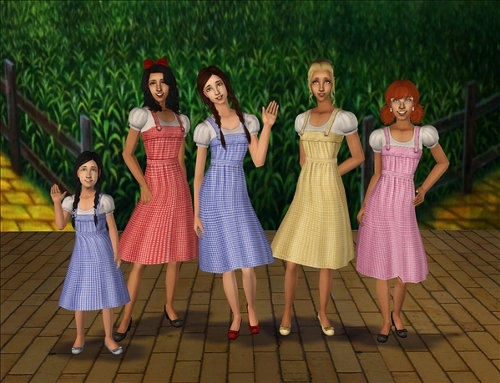 Originally made for a Totally Maxis challenge! (FYI, the mirror link is leading to the Bella Goth ruched dress you did a while back). Oops, thanks for letting me know. :D Glad you like them. These are adorable! I wish I had my game still installed, so I could download these. Glad you could appreciate that! I even used a special silver TXMT so they should really be shiny.